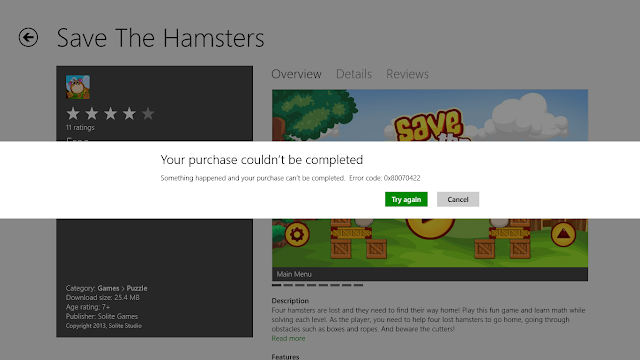 Error 0X80070422 I experienced when downloading games from the Windows Store and install it on the PC that had the Windows 8 OS . then my googling I finally found the way and managed to overcome the error . Save as file name and then write repair.bat . then Save as type select All files ( " . " ) . up storage space after that click save . Well straight to the file we just created repair.bat right-click the file and then click Run as administrator . then open a command prompt program that is executing a command enter a password if asked for a password before executing . wait until the process is completed and the exit itself . You can watch youtube video below as tutorial. If you do not understand with create repair bat file. I was make it for you. you can download it below. extract file and then Run as Administrator. Thank u for solving my problem. But I'd like to know how to remove this setting applied by this "repair.bat" file and what is my windows update setting now. worked like a charm! thx!! Thanky you, it works fine! There is no need to create a .bat file. Just rightclick startmenue and select Command Promt(Admininstrator). This is needful information...greatly appreciated...keep sharing more!!! visit more info Windows live mail support also Call +1-800-231-4635 (Toll Free). It realy worked thank you so much! Tahnk you, it works great. worked, can we stop auto updating apps after that? yes off course. you can stop auto update windows after that. Works well under Win 10 Pro inkl. creatures update. It repairs the download fails in windows store and repair the update function. Thanks a lot. It worked for me after trying several other methods this was the one that actually worked. thanks man.